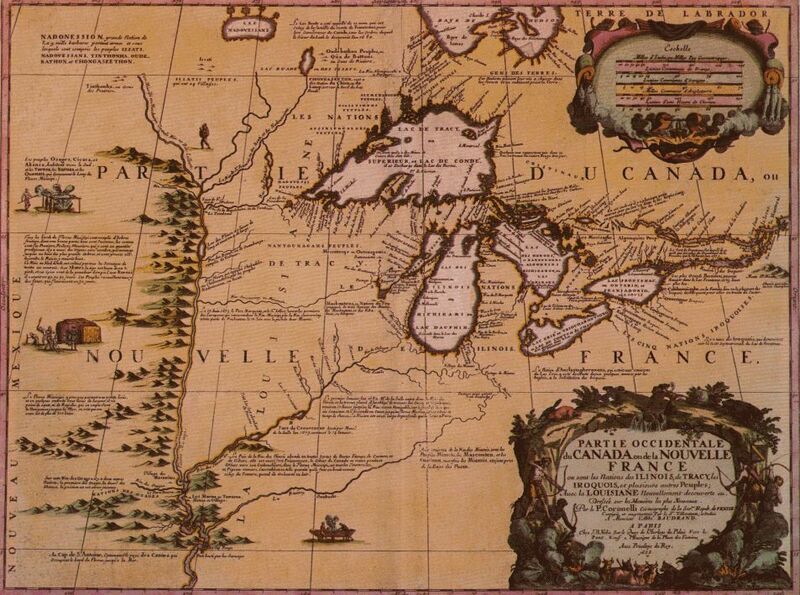 A very important character in Franco-American history, La Salle is best known for his expeditions in the Great Lakes region and the Mississippi River basin at the end of the17th century. 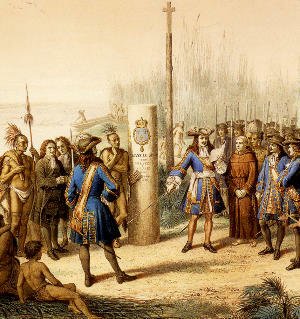 In fact, La Salle is the explorer who eventually claimed the entire Mississippi River Basin for France, naming it Louisiane (“Louisiana”) for King Louis XIV. La Salle was born in Rouen, Normandy, and got his start in life as a Jesuit priest. 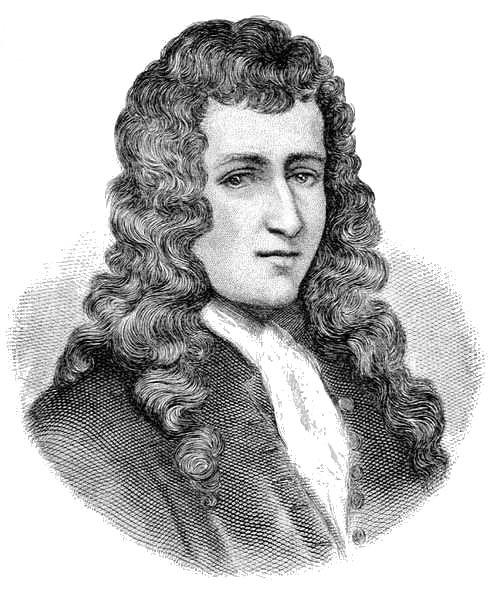 He came to Montréal in New France as a settler in 1666. He was eventually released from his vows as a Jesuit (citing “moral weakness”) and soon dedicated himself completely to discovering a western passage across the New World to the Pacific. 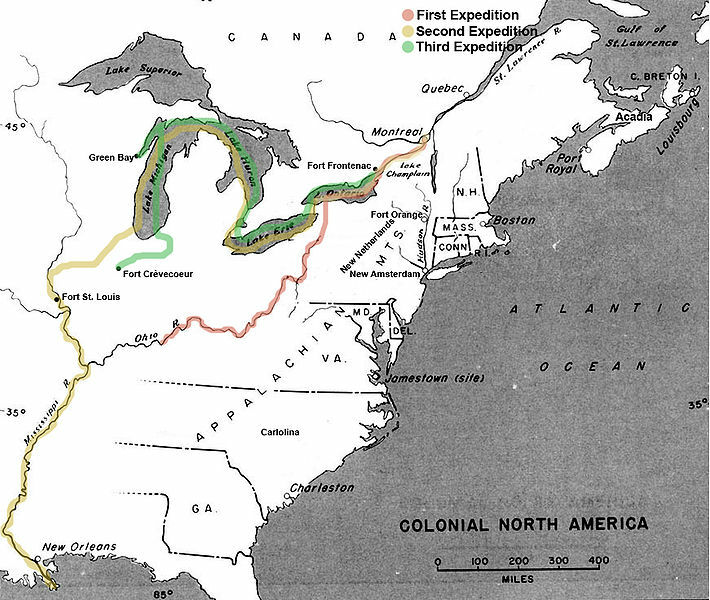 La Salle led several expeditions down the Ohio and Mississippi Rivers from Canada, eventually reaching the mouth of the Mississippi River from the north in 1682. For his exploratory successes, La Salle was handsomely rewarded by the crown with a governorship and letters of nobility for himself and his descendants. The event that interests us today, however, is La Salle’s final expedition to found a French colony at the mouth of the Mississippi. On July 24, 1684, La Salle left France with four ships, 300 colonists, and high hopes. Unfortunately, the expedition was fraught with difficulty from the very start. La Salle lost one ship to pirates in the Carribean, another sank at Matagorda Bay in present-day Texas, and a third ran aground there, where the settlers constructed Fort Saint Louis. On several occasions over the next few years, La Salle led overland expeditions east to locate the mouth of the Mississippi, but on the third and final of these expeditions, his men mutinied and killed him near present-day Navasota, Texas. His colony at Fort Saint Louis survived only a year longer, when the remaining settlers were either killed or taken captive by the Karankawa Indians of the area. La Salle’s legacy is grand. His explorations and fort construction along the Mississippi and Ohio Rivers are credited with establishing what would become France’s commercial backbone in North America, and for containing England’s territorial expansion into the interior for the next hundred years. While he never established his colony at the mouth of the Mississippi, French settlement on the Gulf Coast became a reality a little more than a decade after his death, first at Biloxi and Mobile and eventually at New Orleans. His legacy lives on not just in history books, but also in numerous place names in North America, including towns in Illinois, Michigan, Minnesota, Texas, Québec, Ontario and Manitoba, and counties in Illinois, Texas, and Louisiana (La Salle Parish). La Salle Street, in the heart of Chicago’s financial district, is also named for him.